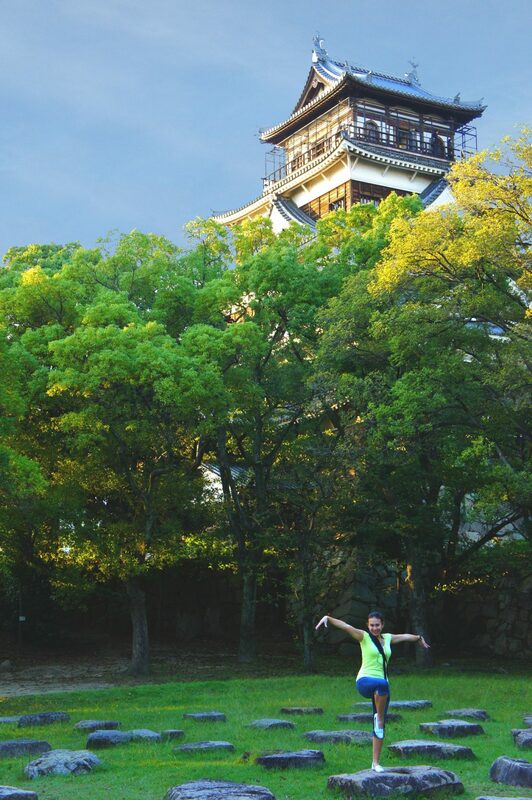 On our second full day in Japan, we put our JR passes to good use and took a day trip to Hiroshima. 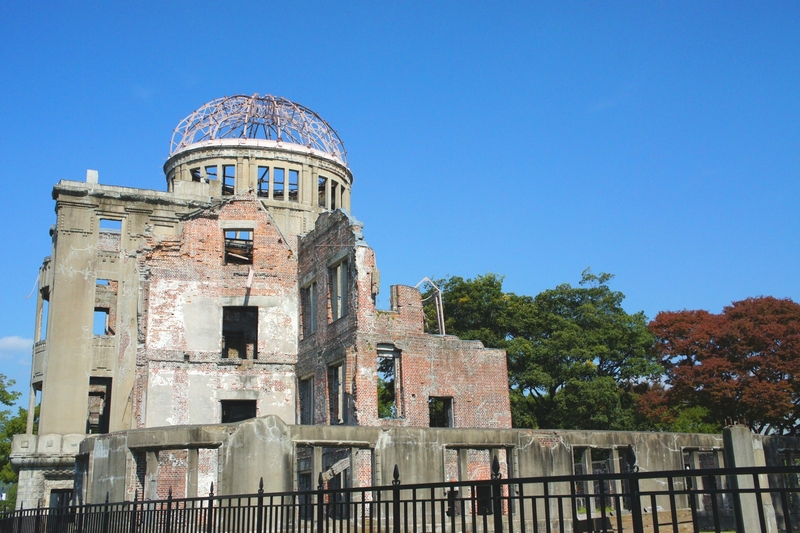 Now, the most common question that I get about Hiroshima is “how do you say ‘Hiroshima’?” It may surprise you to find out that one does not need to actually visit Hiroshima to answer this question – there are resources one can consult. Still, in case you’re curious, it is roughly pronounced “Hee-roe-shee-mah” (not “Heer-aw-shim-ah”). Now that that’s out of the way, let’s talk about what we did that day. The Missus, Kat and I had an early morning, though it wasn’t as early as Kat might have liked. The Missus and I slept in nearly every morning in China, and it looked like we’d be keeping that grand tradition alive in Japan. Still, it wasn’t long before we found ourselves meandering through Osaka Station in search of the Shinkansen to Hiroshima. Now, the previous post about our arrival in Osaka had to cover a lot of ground, and I may have neglected one very important point: Osaka Station smells delicious. It’s fitting that the first thing that one detects when entering or leaving Japan’s culinary capital is the pleasing aroma of baked goods. Our noses quickly convinced us to grab a bite to eat before we left. 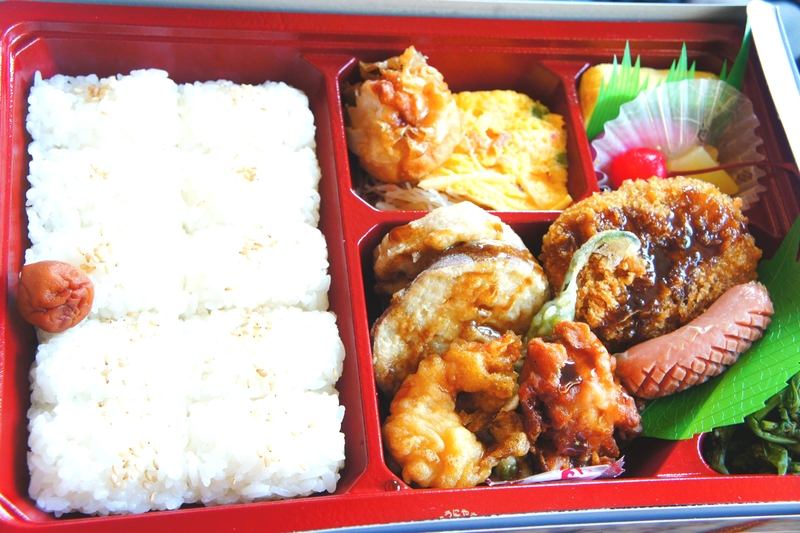 This bento box may not have been baked, but it was delicious. The Shinkansen rocketed across the 300km to Hiroshima in less than two hours. On arriving, we were greeted by gigantic arrows pointing us towards the city’s major tourist attractions – Peace Memorial Park and Miyajima. We didn’t have time to visit Miyajima, which is a nearby island with a shrine built in the water next to it. It sounds totally awesome, but I was personally more interested in seeing the site of the bombing of Hiroshima. Little Boy detonated nearly directly above a building that is now fittingly known as the A-Bomb Dome (or as the Genbaku Dome in Japanese). A streetcar runs direct from Hiroshima Station to the dome. The dome is technically preserved as a historical site, although (as a memorial to destruction) it is kept in a state of disrepair. I’m not sure which word to use to describe the feeling of standing at Hiroshima’s ground zero. The purpose of this blog isn’t to get all weepy on you, so let’s just say that it was surreal. Beyond that, you’ll just have to look at the photos to get a sense of the place. Life has sprung up around the dome. It was actually a beautiful day, in a sombre sort of way. The steel reinforcements were put in to prevent the dome from falling apart completely. The rest of the park is immaculately manicured. While snapping the above photos, I tripped over a root and dented my camera’s lens. Luckily, it still works. I also scraped a knee, which normally wouldn’t be an issue. Unfortunately for me, Japanese culture involves a lot of kneeling; we’ll revisit this topic in the next day’s post. Still, it’s hard to complain about a scraped knee while you’re walking around a place that has literally experienced more destruction at the hands of humanity in the space of one minute than most places on Earth have ever seen. The Peace Memorial Park is more than just the A-Bomb Dome. A wide swath of land in the area has been converted into a park, and is covered in monuments dedicated to peace and to various groups of victims of the blast. We visited all of them, but I’ll just share the highlights. The first was the Memorial to Mobilized Students. 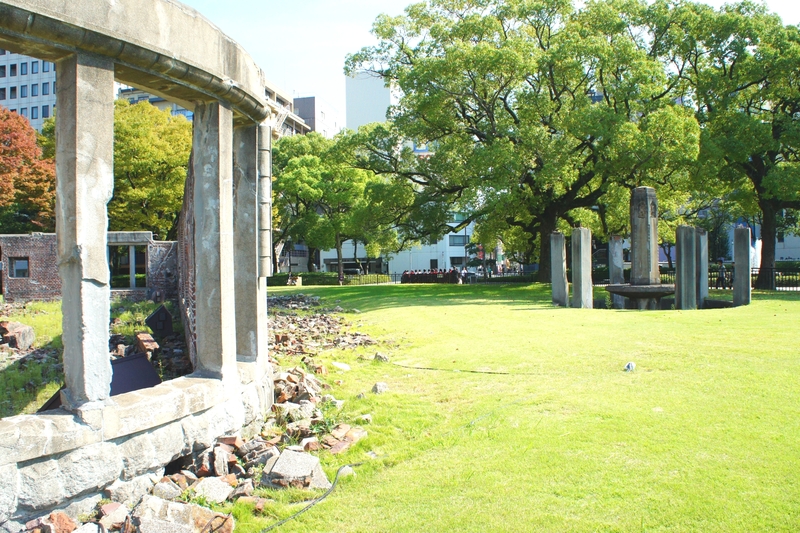 According to the audio recording stationed in front of it, many students were mobilized for the war effort, and so were in downtown Hiroshima at the time of the bombing doing labour in shops or factories. The statue at the base is Kannon, the Goddess of Peace. Eight stone doves rest on the tower itself. It is common in Japan to hang chains of paper cranes in shrines and at monuments. These are usually chained together in sets of 1000; such a chain is called a senbazuru. 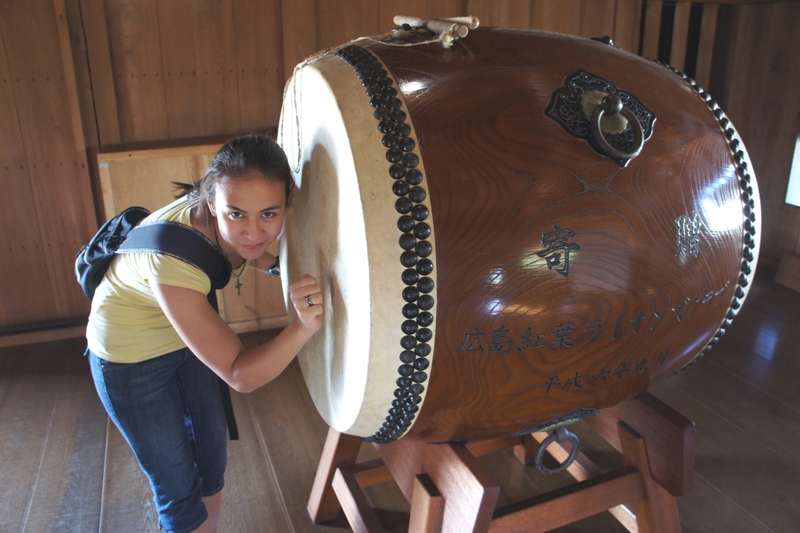 This practice is particularly common in Hiroshima, and it’s doubly popular with monuments involving children. The cranes are often arranged in attractive rainbows of colour, or made with particular patterns of paper so as to add a personal element to what is otherwise a fairly uniform design. Japanese tradition holds that folding a senbazuru will cause a wish to be granted. There were a number of other monuments erected by local organizations. 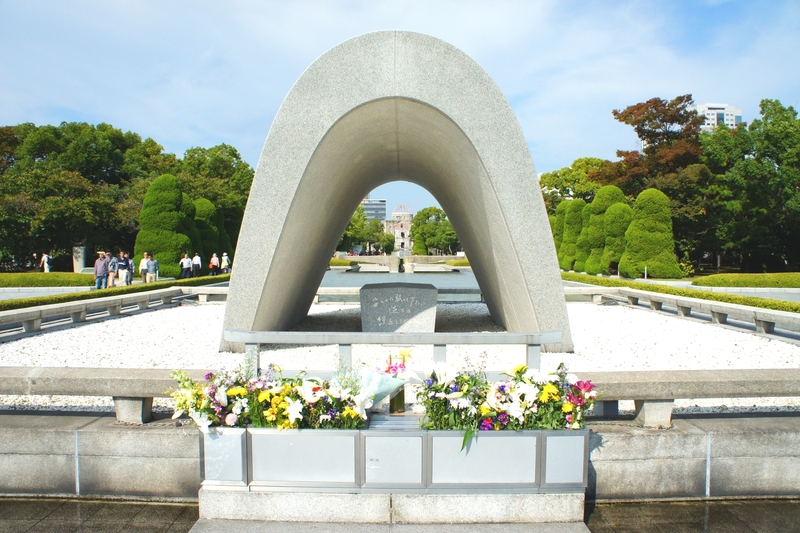 Two of the more idiosyncratic monuments were a large black cylinder topped with four large lights (erected by the Hiroshima Gas Corporation) and a stone tablet engraved with a message that analogizes hair to hope, life and the spirit (erected by the Hiroshima Hairdressers’ Association). 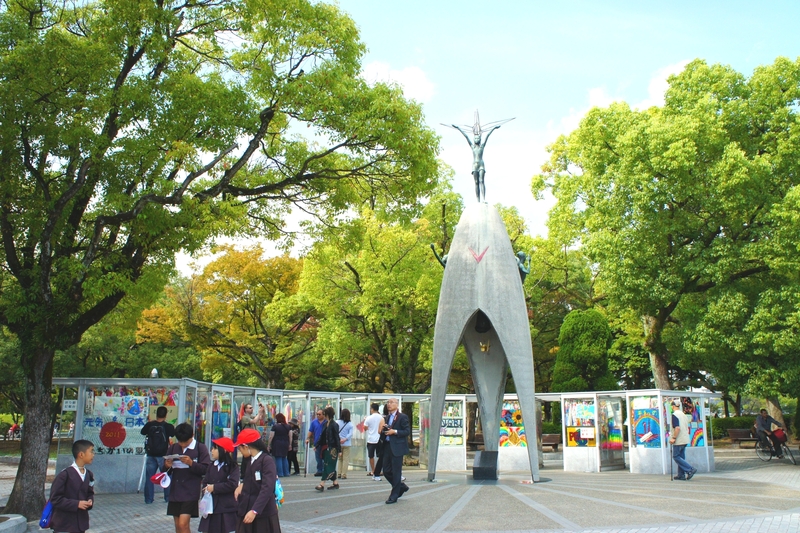 There were also smaller monuments featuring the likenesses of people who gave assistance to Hiroshima’s people in the aftermath of the bombing. These latter monuments were not as amusing. There’s plenty more of the Peace Memorial Park for me to talk about, but I feel that I should point out that Hiroshima is not a dour city at all. In fact, Hiroshima is pretty idyllic. 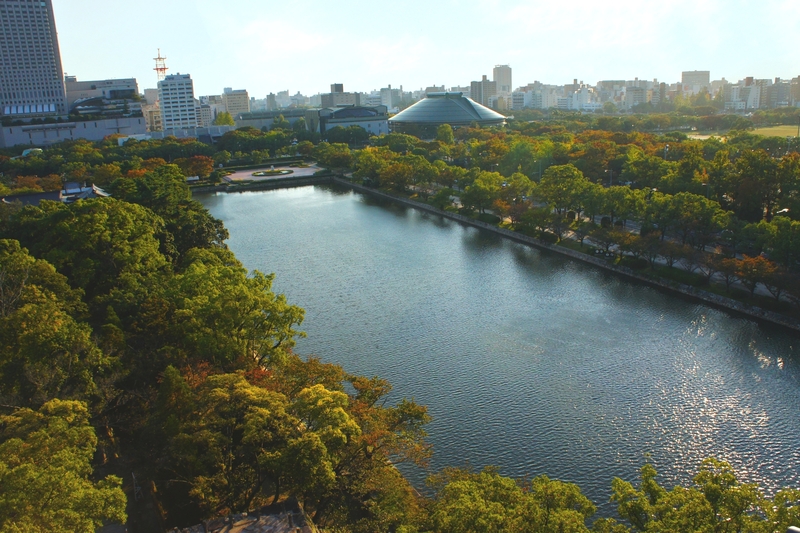 There are wide green spaces, clean streets, friendly people and a rich local culture (including a highly-recommended local variant of okomiyaki). There’s even a castle! We’ll be seeing more of that later on in the post, but I want to give you something to look forward to now, because this next part is pretty depressing. Alternatively, just think back to this scene. You’ll feel better right away, guaranteed. 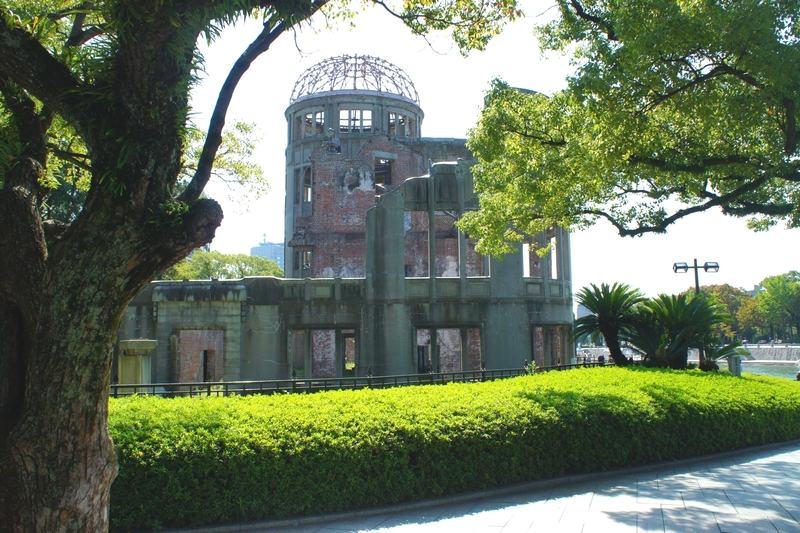 The centrepiece of the Peace Memorial Park is the Hiroshima Peace Museum. Now, my understanding of Japanese culture is that they generally prefer not to remember all those times that they brutally oppressed POWs and civilians throughout the Asia-Pacific region. Apparently no one told this to the curators of the Museum, because it starts out by tearing a strip off of their ancestors for their various acts of aggression. The exhibit admonishes its Japanese patrons to avoid the sins of their forebears. 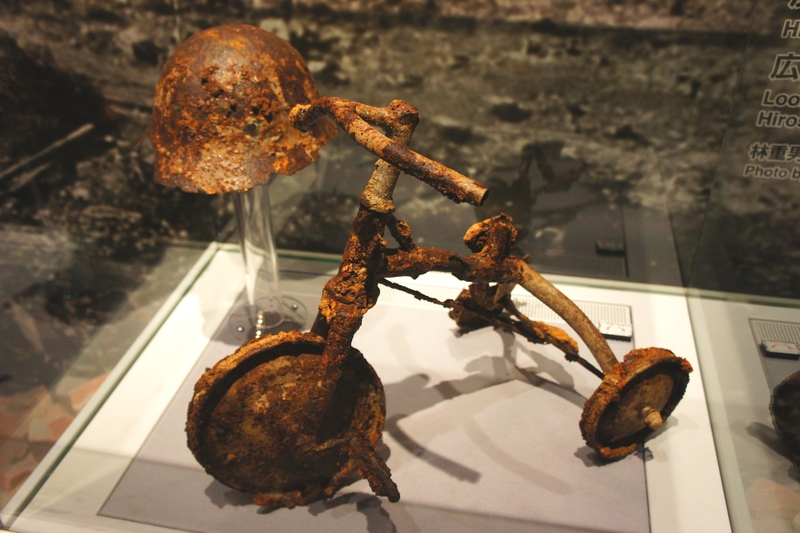 The bulk of the exhibit, however, is dedicated to remembering how terrible it was that time that Hiroshima got bombed. 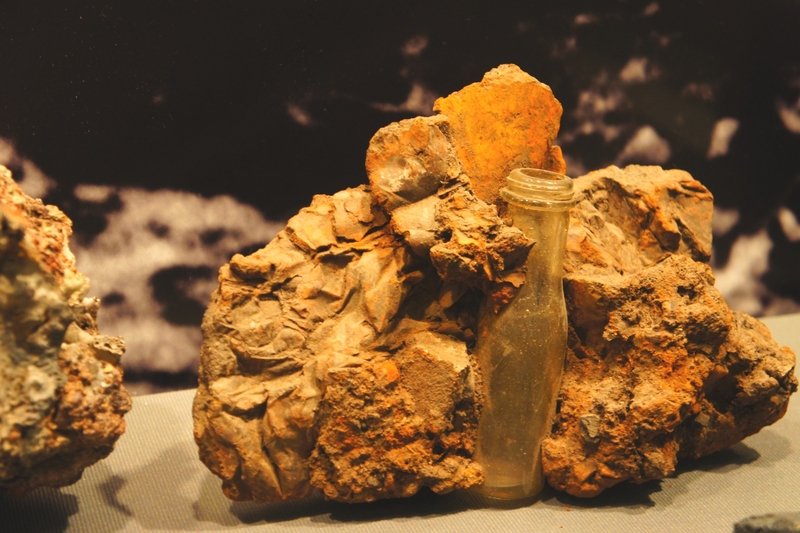 There are a number of artifacts from the bombing scattered throughout the Museum. This was sort of a big deal to me; actually standing in front of a battered wristwatch that was frozen in time at 8:15am, August 6, 1945 was even more poignant than standing at the dome. Granted, the watch doesn’t actually have dates, but the effect was not diminished. 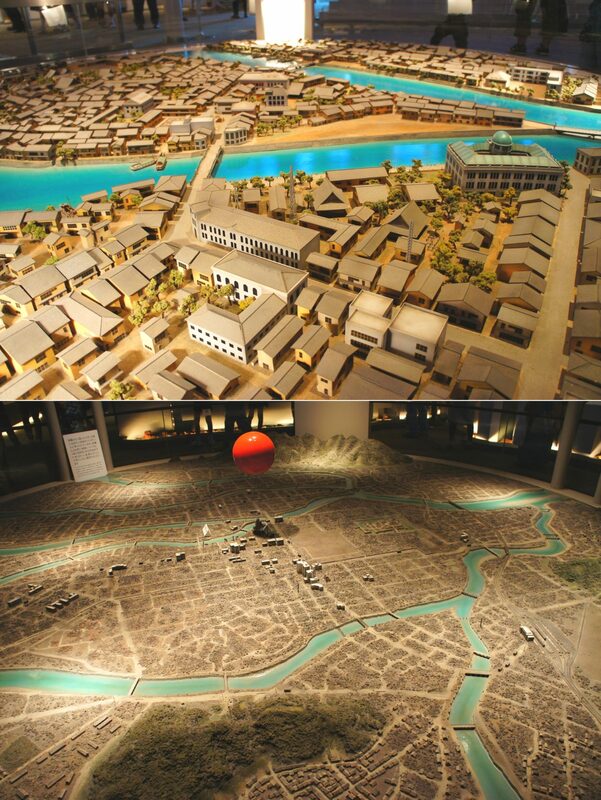 The exhibit also hosted reconstructions of the city before and after the blast. The differences were dramatic, as I’m sure you would expect. The red ball shows the explosion a fraction of a second after detonation. Unsurprisingly, Japan is not crazy about nuclear weapon testing. Hiroshima, in particular, is a vocal opponent of this practice. Since 1968, the mayor of Hiroshima has published a letter of protest for every nuclear test, world-wide. To date, there have been 597 such letters, each individually and passionately written. 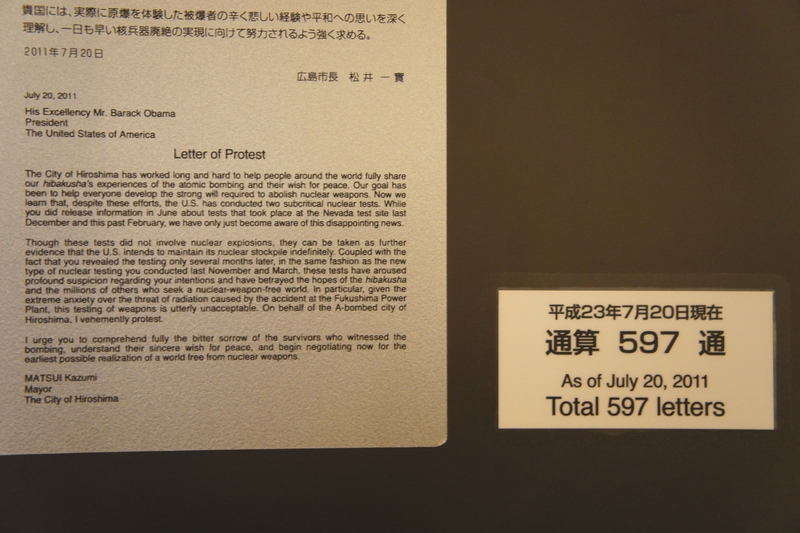 Many refer to topical events – for instance, the most recent letter (to US President Obama) references the Fukushima power plant disaster. The exhibit quickly shifted towards the immediate aftermath of the bombing. 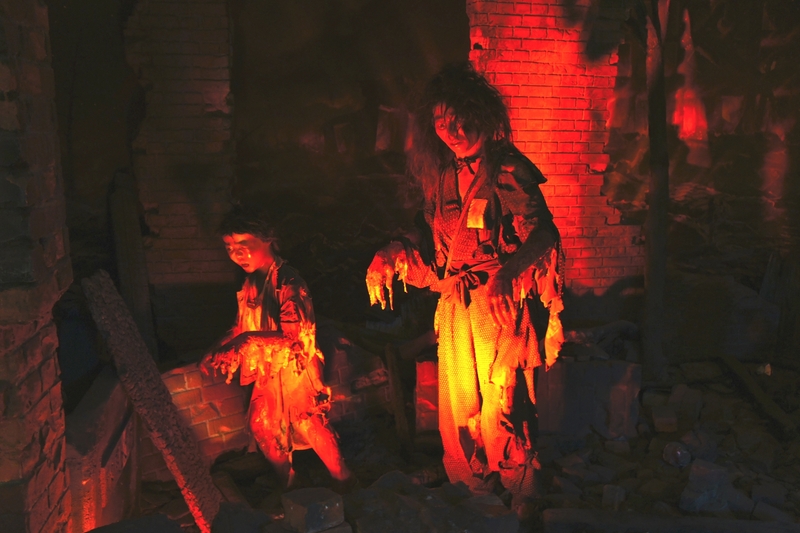 Featured prominently was a wax replica of people being melted by the blast. It was… unappetizing, although I expect that the curators’ goal was not to assist in our digestion. Zero punches were pulled in the making of this exhibit. 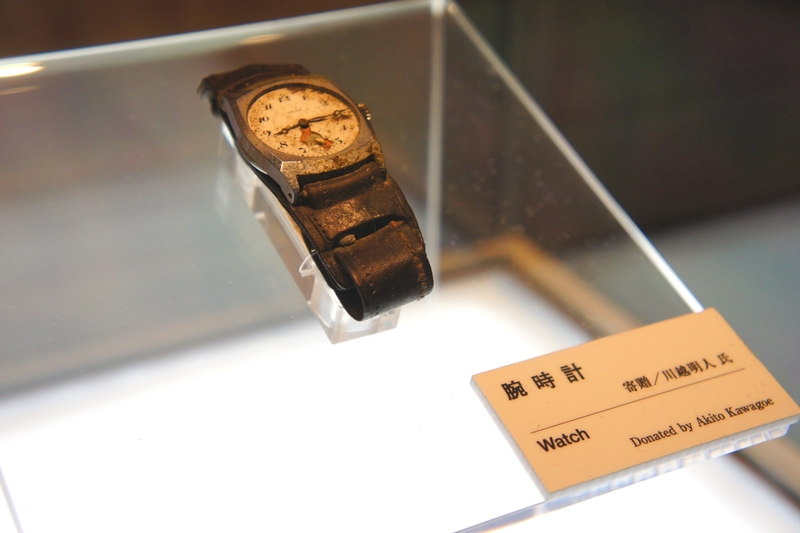 Upstairs were a number of artifacts pulled from the wreckage, much like the wristwatch that I mentioned before. These ranged from children’s tattered summer uniforms to gristly photographs of charred citizens shortly after exposure but just before death. If it’s all right with you, I’m going to skip those and focus on the items that were only mostly horrifying. This tricycle did not fare well in the blast. The faint shadow on the ground is all the remains of someone who was sitting on those steps. The blast melted roofing tile and other materials, sometimes wrapping them around nearby objects. These weren’t even the most distressing part of the exhibit. Those came at the end. The Museum stored video and audio recordings of the survivors of the blast (called hibakusha), as well as their hand-drawn images recording the explosion and the illnesses and infamous black rain that followed it. Those don’t carry over as well in pictures without the whole context, so we’ll just move on to happier topics. You may be familiar with the story of Sadako Sasaki. 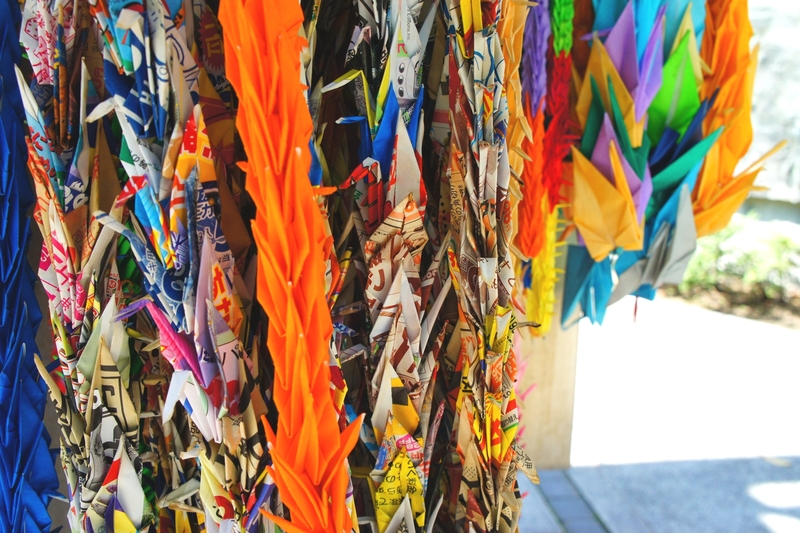 She was a Japanese girl who got leukaemia from the blast in Hiroshima and took to folding paper cranes in the hopes that her wish to be cured might be granted. It wasn’t, and she died. Which … is not a happier topic at all, I admit. 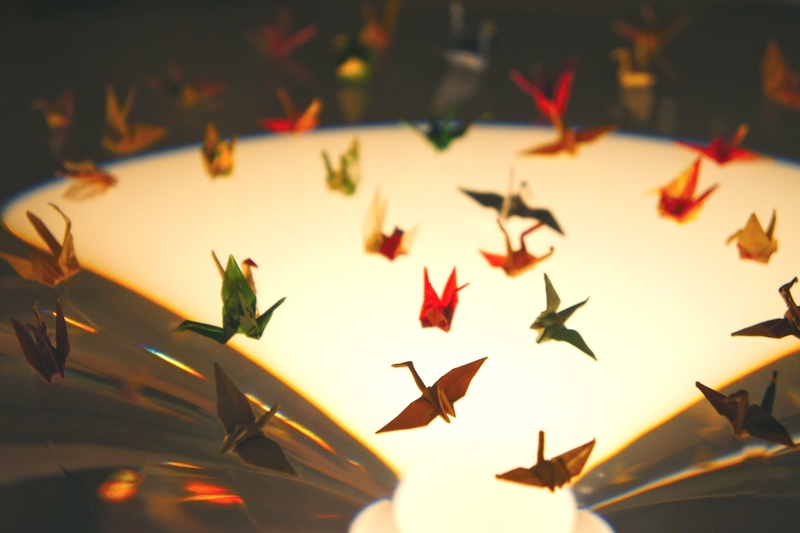 However, it is a much-beloved children’s tale, and the Museum hosted some of her original folded cranes! Sadako is credited with the worldwide popularity of folded paper cranes. 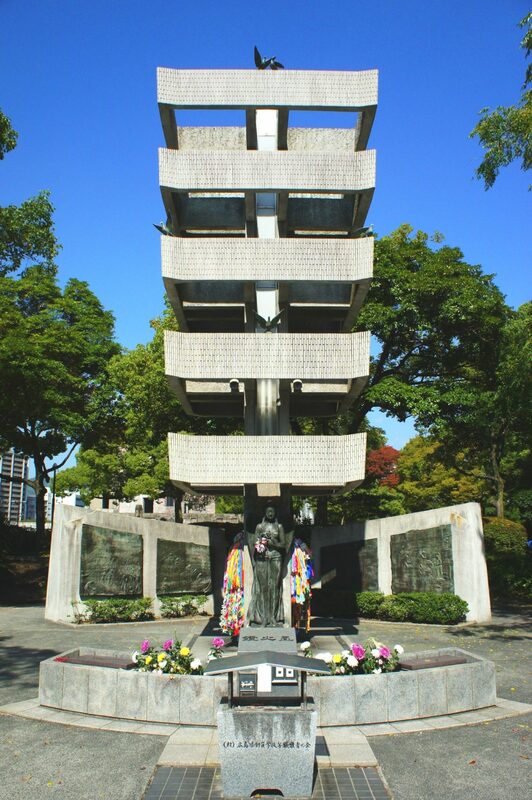 Nearby the Museum, in the greater park area, is a monument to Sadako and the other child casualties of war. It is surrounded by thousands of senbazuru, and features a bell (in the shape of a golden folded crane) that visitors ring as a symbolic affirmation of their dedication to world peace. [amelia] and Kat rang the Children’s Peace Bell; I saved my energy for the grown-up Peace Bell. The centrepiece of the park is the Cenotaph, inscribed with these words: “Let all the souls here rest in peace, for we shall not repeat the evil.” This is the site where peace-related ceremonies and demonstrations are often held. From this point one can see the Eternal Flame and A-Bomb Dome. The Cenotaph holds the names of all those killed by the bomb. 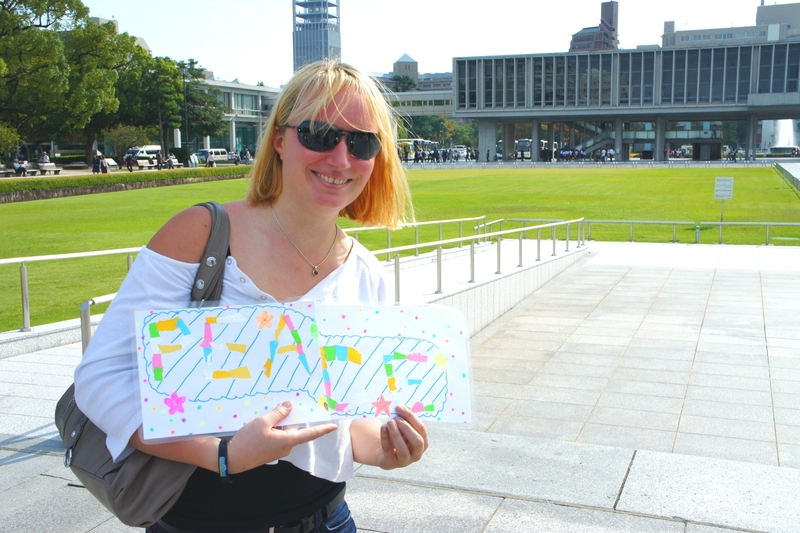 Now, there’s something that all foreigners ought to know before wandering in to Hiroshima Memorial Park. The place is crawling with tiny, adorable schoolchildren all sporting the same brightly coloured baseball caps. And they aren’t just wandering passively; these kids are on a mission. Of peace. And also grades. Mostly grades, probably. 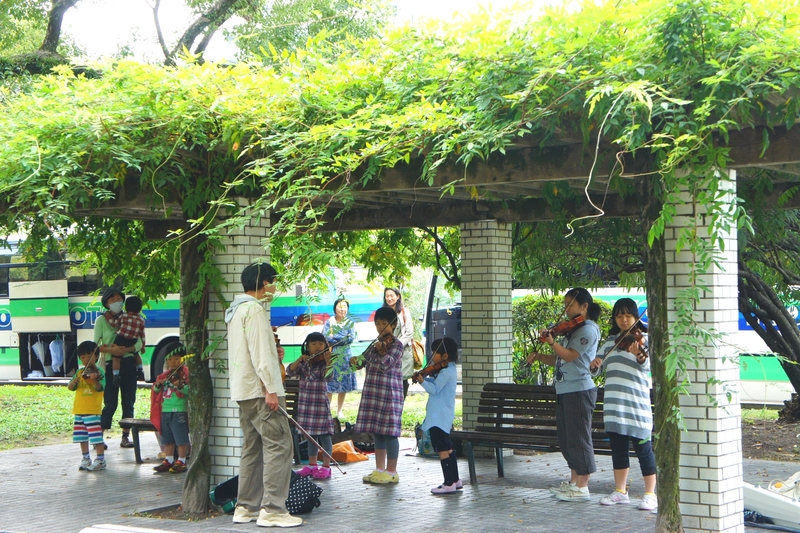 These schoolchildren have been tasked to make peace-related arts and crafts and hand them out to foreigners in the park. 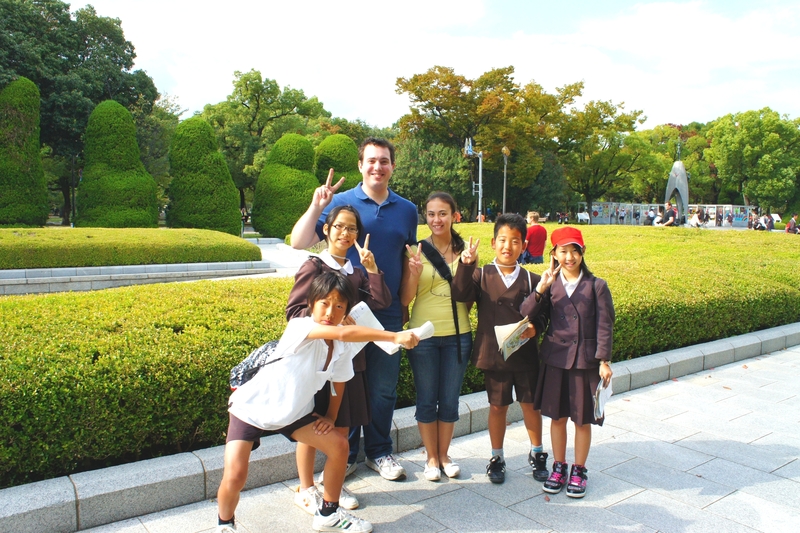 In addition, to get English credit (and also world peace), the students ask you for your name, where you are from, how you like Hiroshima, and where else you are going in Japan. All of your responses get neatly printed in little notebooks. Once they’ve finished asking their adorable scripted questions, they pose for a photo and wish you a happy visit to Japan. This was pretty adorable the first time it happened. By the third or fourth time… well, it was still pretty adorable. We could have answered those same four or five questions all day. [amelia] and I wandered off. There weren’t many foreigners in the park that day, so Kat got mobbed. The kids assumed Kat was American, due to her resemblance to Alaskan lobster. 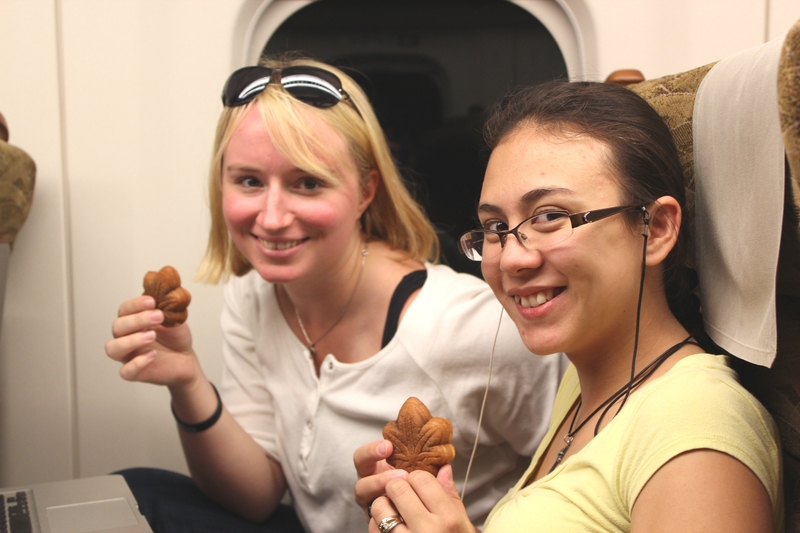 We blended in with our mastery of local customs. The Peace Park wasn’t solely devoted to monuments commemorating the atrocities of war. 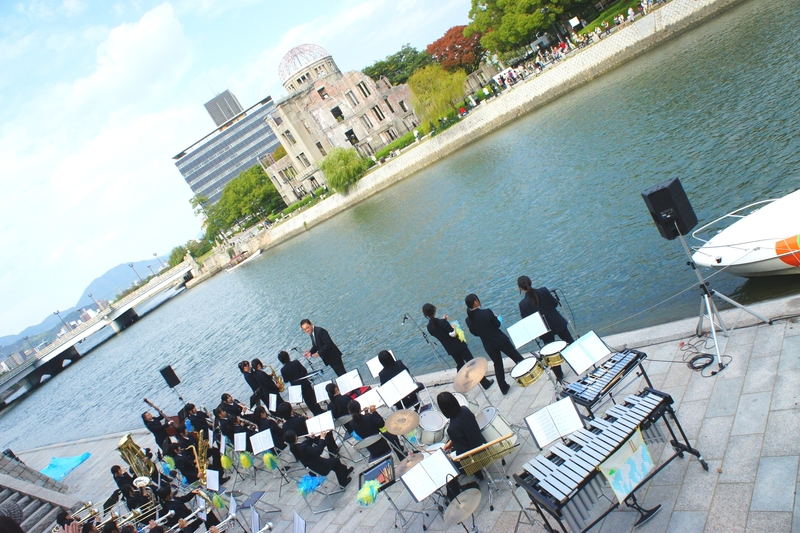 Just across the river from the A-Bomb Dome was a classical orchestra gaily playing upbeat accompaniment for the tourists. The smiling conductor and cheerful music helped soften the blow of some of the more sombre monuments. Across the park, there was another band playing near the monument to the Korean victims of the blast. Being as the band was composed of little children, it was adorable. Being as they were Japanese children, it was also very good. What? Some stereotypes are positive. By this time, we had filled our eyes, brains and ears with things both beautiful and terrible. Our tummies, however, were starting to feel left out. We elected to eat at an open-air riverside diner, located within earshot of the riverside orchestra (the grown-up one, that is). 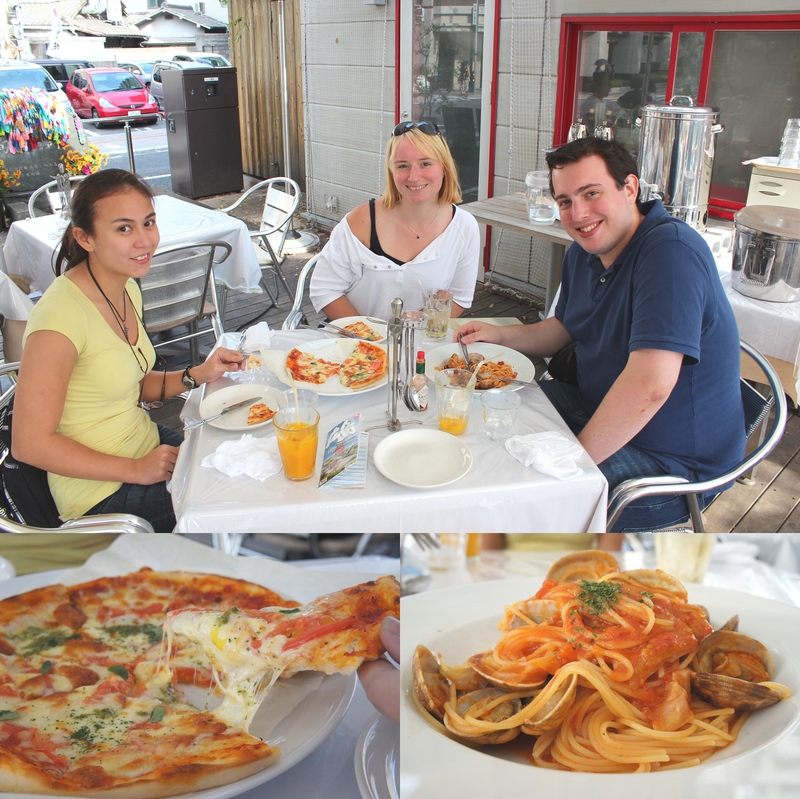 Upon seating, we discovered that the diner specialized in exotic cuisine – namely pizza and pasta. The red-headed waiter should have been a tip-off that we wouldn’t be finding much in the way of Japanese food. 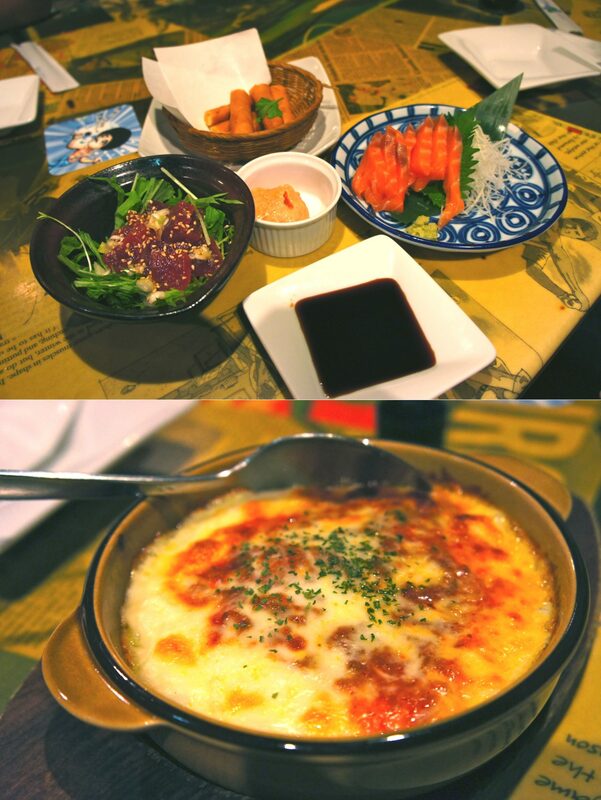 Still, we were not disappointed to have some familiar fare. Our tomato-based food was almost as red as our lobster friend. After lunch, we bid adieu to the Genbaku Dome and began walking towards Hiroshima Castle (Hiroshima-jo). It is not far far from the Peace Park. 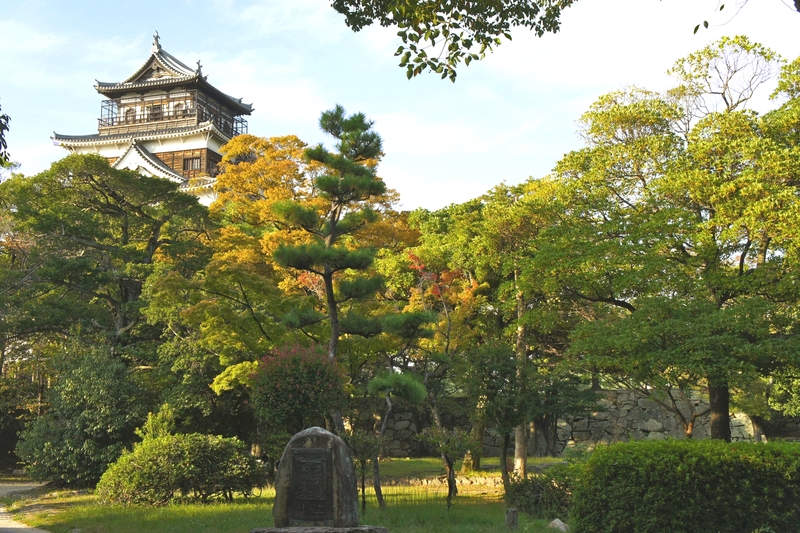 Being as the Peace Park is where the atomic bomb detonated, it should not surprise you to discover that today’s Hiroshima Castle is a reconstruction of the original. The main keep poked out over the trees. A sensible choice, security-wise. The castle itself was fairly small, but was surrounded by a reasonably-sized moat and substantial grounds. 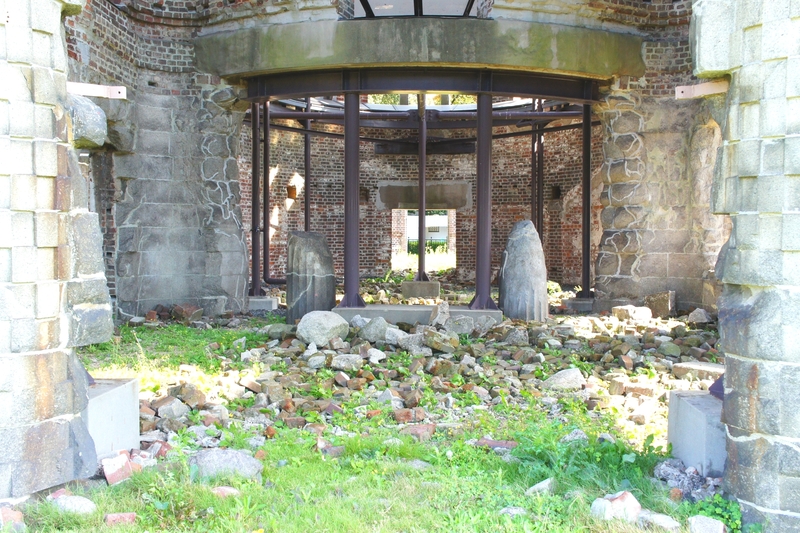 The grounds were home to a variety of structures, including a shrine and some barracks. The shrine appears to still be carrying out its traditional purpose (in fact, we saw a family carrying out a ceremony with an adorable kimono-clad baby), but the barracks and keep are now museums showcasing Japanese culture from Hiroshima’s feudal history. 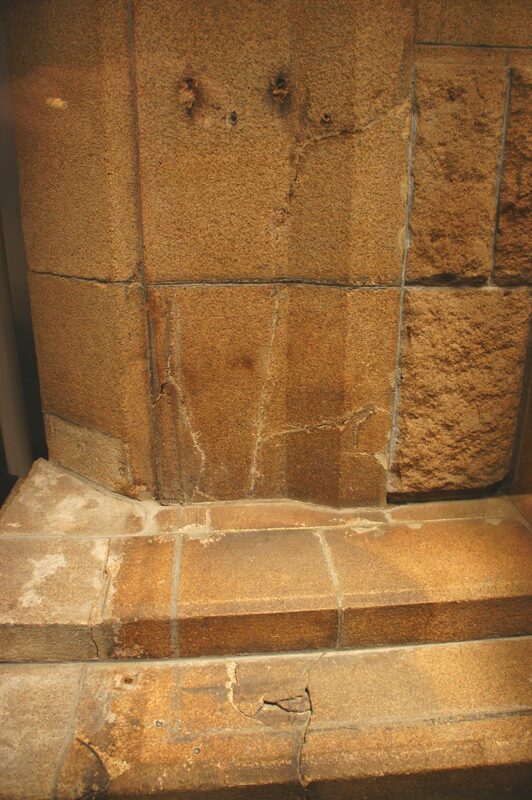 The barracks mostly dealt with architectural techniques and styles over the centuries, as well as the political landscape at the time of the building of the original Hiroshima Castle. Apparently it was a pretty controversial construction, as it was built without the permission of the ruling shogunate (a big no-no at the time). At any rate, the Japanese have come to embrace it over the last 400-or-so years. Apparently some of that rebellious history was having an effect on [amelia]. 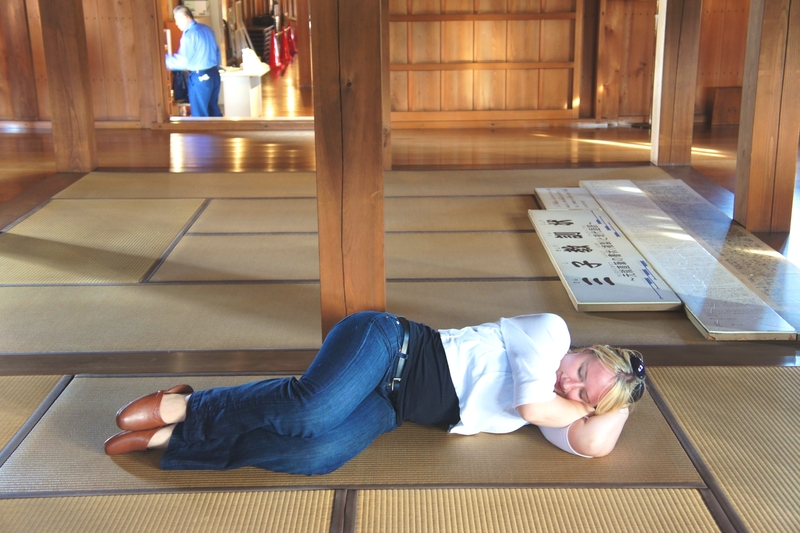 Kat experimenting with some tatami mats, a standard part of traditional architecture. After viewing the grounds and barracks, we went in to the main keep. 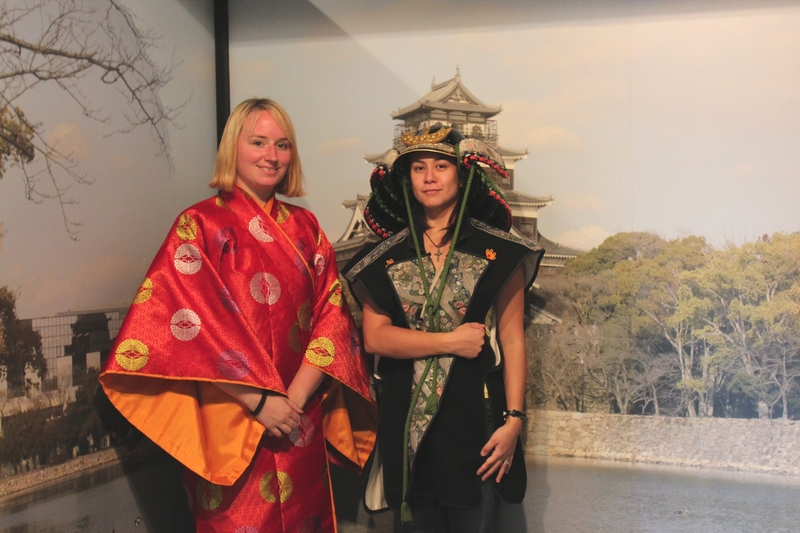 It is devoted to cultural artifacts, complete with swords, paintings, sculptures, and so on. We even saw a sword made by Masamune! Unfortunately, no photographs were permitted in the exhibition areas, so all I have for you is this photo of The Missus and Kat in totally-authentic period dress. Kat gravitated towards the red dress. Birds of a feather, I guess. From the top of the keep we could see out over the grounds and moat. 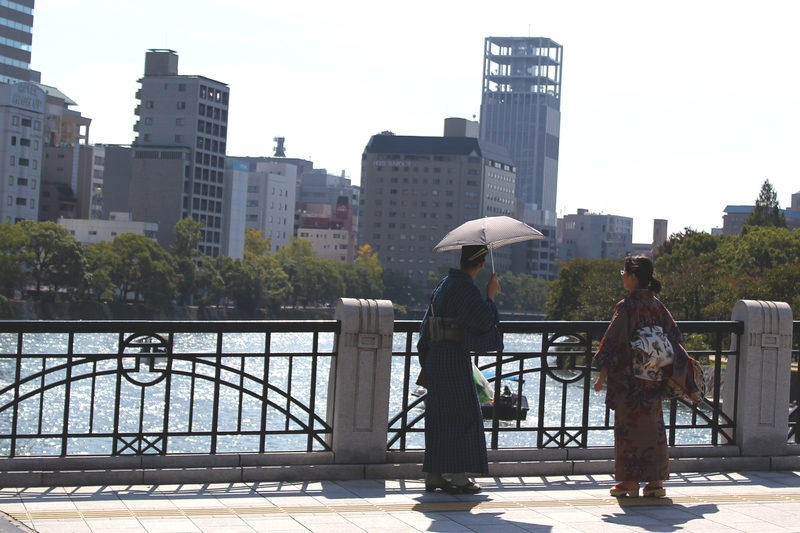 It was apparent that Hiroshima’s got a pretty good thing going on. I don’t know if this is invasion-ready, but it sure is attractive. It soon came time to leave the castle. We were headed towards the renowned Shukkeien Gardens to the east of the castle, though we stopped a few times for the sake of frivolity. Just like the samurai of old. 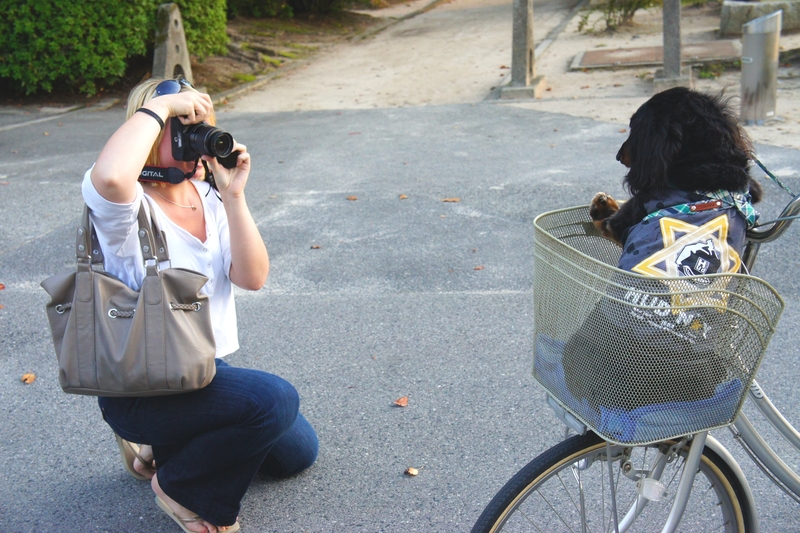 This adorable dog wasn’t Kat’s only target; she also tracked down some cats. By this point we were fresh out of cash, so we stopped at an ATM. I may not have mentioned that Japan is a primarily cash-based society. This was very surprising for me. I usually actively avoid carrying physical currency; if I can’t pay via credit or debit, I won’t be paying at all. This is easy to do in Canada, but is much harder in Asia, where credit cards seem to carry a stigma (at least among the middle class) and debit transaction fees are seen as onerous. I had expected this to be different in Japan, but such is not the case; the only thing a plastic card is good for is withdrawing physical money from a cash-dispensing machine. This leads to a small problem for international travellers such as ourselves. Most ATMs in Japan work only with Japanese bank cards. 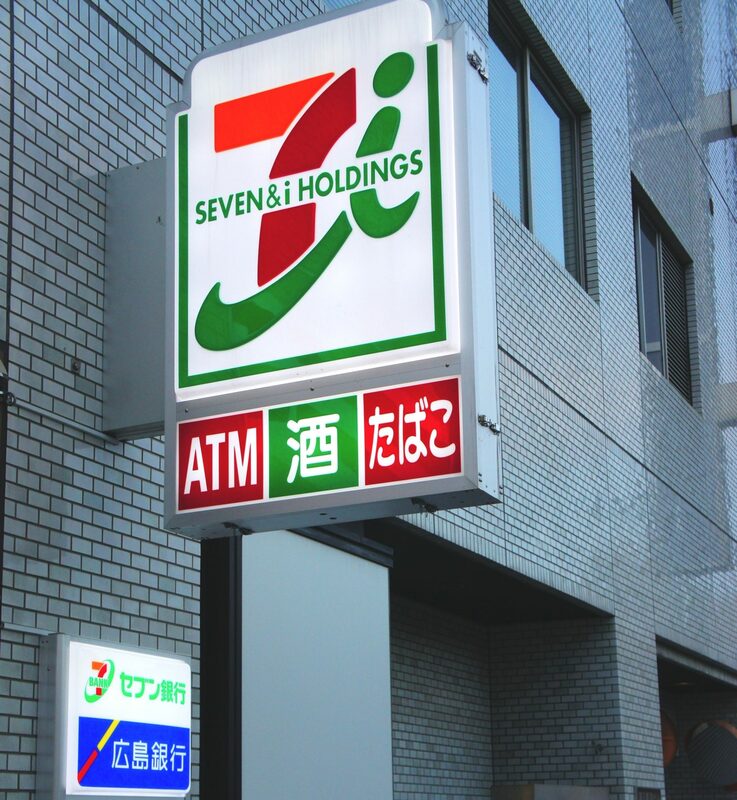 The only reliable safe haven for foreign dollar-holders is 7-Bank, the foreigner-friendly bank owned by 7 & i Holdings, which also owns 7-Eleven. As a result, foreigners want to stay on the lookout for 7-Eleven convenience stores while in Japan; they’re your best option for your banking needs. I’m not making this stuff up. 7-Eleven basically runs all of south-east Asia, as far as I can tell. Since we were already there to withdraw money, The Missus figured that we might as well buy some snacks. 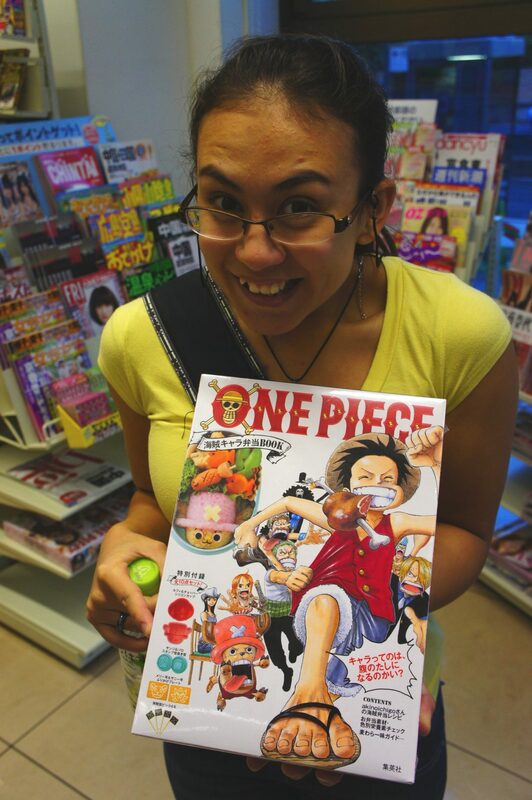 She found an adorable One Piece bento box. For the non-Japanophiles, One Piece is a popular series of graphic novels (“manga”) and cartoons (“anime”), among other things. It is heavily merchandized. We went from the 7-Eleven store to the now-nearby Shukkeien Gardens. It was at this point that we discovered that they were closed, and had been since before we’d left the castle (on this particular Sunday, they closed at 5 o’clock, and it was now close to 7). This was unfortunate, but we didn’t mind very much; it had been a busy day, and we were ready to head back to Osaka. We headed back to the train station, where I decided to buy some unfamiliar snacks. 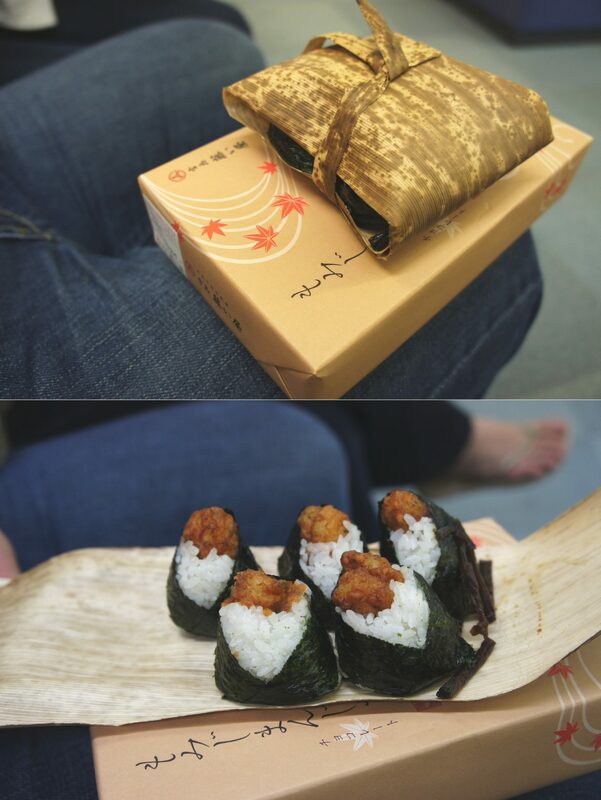 They were wrapped in some fibrous plant matter that we assume is bamboo bark; this technique is popular for certain foods in Japan. The snacks themselves were similar to sushi, except that they were cooked and the lady selling them warned me that they were “spicy”. Perhaps the ones I got were defective, but I did not find them spicy at all. Maybe she was compensating for previous bad experiences with some westerners’ over-sensitive palates. Or maybe my Jamaican heritage makes me immune. The box in the photo above held maple-flavoured cookies. Maple flavouring is something I associate fairly strongly with Canada, but Japan also happens to be home to a large number of maple trees, and where there are maple trees there is maple flavouring. I don’t know whether it’s safe to feed lobsters cookies. Don’t try this at home. We arrived back in Osaka just in time to grab a late dinner before bed. We headed to the trendy restaurant area that we’d visited the previous day, where one of the greeters that had been positioned outside caught our attention. We hopped in an elevator and arrived in a little place that was part restaurant and part tapas bar; their menu covered the usual breadth of a restaurant, but everything came in tiny, appetizer-sized portions. It’s an interesting approach. None of these plates are much larger than a drink coaster. Upon finishing up and receiving our bill, we discovered some surprise charges. On top of the food that we had ordered, we had also been charged a seating fee equivalent to about twelve dollars (plus the cost of a bowl of edamame – salted soy beans – that is apparently obligatory). We were informed that this was customary in trendier establishments. The Missus was inclined to accept this, but Kat and I were not. We were caught in a difficult place; we weren’t willing to pay for things that we hadn’t agreed to (we are, after all, law students), but we didn’t want to be culturally insensitive. To make things more challenging, the staff had limited English, and our Japanese is basically non-existent. Kat and I ended up politely-but-firmly pantomiming with the manager for a while until he agreed to waive the seating charge. Well, I say “politely”, but The Missus informs me that our server (with whom we initially negotiated) was quite distressed by the end of it – The Missus tells us that she saw tears. Kat and I still feel pretty bad about this. We had been careful to remain calm and use (what we thought to be) respectful language, but we seem to have a lot to learn about the finer points of civil disagreement in Japanese society. From that point on, we did not dispute any charges in Japan. Although our day ended on a somewhat sour note, in retrospect it was pretty great overall. However, it pales in comparison to the adventure we had in the next two days. In the next post, we’ll explore Mt. Koya together. 5 May 2012 11 February 2018 Christopher ScottComments are off for this post.